Constantine were one of the in-form teams in the early matchdays of this year’s Champions League, setting the competition alight with an early victory away to Club Africain. Two successive defeats to Club Africain, in Constantine, and TP Mazembe to round off their group stage, plus the banning of their fans after excessive smoke in the Club Africain defeat, has seen things start to turn out for the worse. Fortunately, that ban on fans has been overturned after an appeal and Constantine will have their fanatical fanbase with them. Esperance are the defending champions and have shown that business is as usual in this year’s edition while not catching the eye as much as the other contenders. This match represents a stiff test but the core that they had in last year’s competition is still there and still performing. More than any other team left in this tournament, they seem less susceptible to bad days at the office that can quickly morph into exits, with the strong defence and gladiatorial midfield they had last year still in tact. There’s no doubt that Simba have been the story of this year’s CL so far. Few thought they would survive their Group of Death but they just about squeezed through after Clatous Chama’s dramatic last-minute winner versus Vita Club. They have achieved the improbable by maximising their home advantage, with Dar es Salaam’s National Stadium jam-packed for every home game. Simba will be looking to improve their form on the road where they have taken comprehensive beatings, to the extent that they wouldn’t be in the quarter-finals had their matches in the group stages been aggregate scores. TP Mazembe await them and Patrick Aussems’ men will have to take a huge advantage back to Lubumbashi. Their compatriots Vita Club went to Dar es Salaam perhaps too preoccupied by mind games, with complaints about the smell of the changing rooms and face masks used. TP Mazembe are more seasoned to such outings though there are fitness doubts to their star man Tresor Mputu will be a tougher challenge. These two clubs are familiar after meeting in May and July last year in the group stages. Wydad have the upper hand in this encounter and Horoya, despite qualifying for the knockout stages, sacked their coach Victor Zvunka. The Guineans are capable of springing a shock and continue to go under the radar, but may not have the necessary quality to make an impact in the knockout stages. Wydad, meanwhile, are flying high and have all but won the Moroccan League, giving them the chance to point all their weaponry towards a continental title. 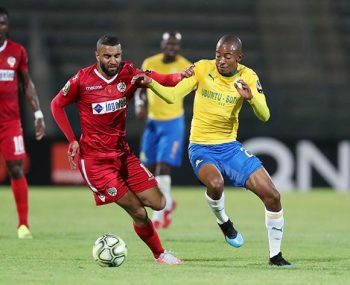 An explosive semi-final either with Al Ahly, who they beat to win the trophy two years ago, or burgeoning rivals Mamelodi Sundowns would await them if they progress. They can comfortably count themselves as one of the contenders with the experience of Faouzi Benzarti on their technical bench and the typical steeliness he adds to his teams. No team has played more scintillating football – at home at least – than Africa’s most successful club, with turnovers in possession quickly turned into memorable team goals and record signing Hussein El Shahat often at the heart of it all. They have failed to produce such football when travelling, sneaking just one point from three games. They lost to Simba and AS Vita Club and were lucky to escape with a point against Saoura in a string of underwhelming performances. Mamelodi Sundowns would be well within their rights to believe that they can oust Al Ahly in this one, but for that to happen they must take a resounding lead into the second leg. The South African side have accumulated plenty of experience in the last few years but losses to Lobi Stars and ASEC Mimosas, that should have at least been draws for a side of their calibre, saw them finish runners-up in their group and sees them in a difficult situation. They have the coach and players to get out of such a tight spot but they will have to be at their best and pray that knockout-football Al Ahly doesn’t turn up.